SAN ANTONIO, TEXAS — As I returned from church on Sunday this notice was in my VOL e-mail from a friend in San Antonio. I was floored! I didn’t believe what I was reading. I thought it was a hoax or fake news. I personally know the good Sisters from having attended various Anglican Use events and Becoming One gatherings with them at Our Lady of the Atonement (OLA) Catholic Church. The last time I saw the Sisters was in mid- August when I went to San Antonio to cover the installation of OLA’s new rector, Fr. Mark Lewis, following Fr. Christopher Phillips’ contentious removal as rector to pave the way for the founding Pastoral Provision parish of the Anglican Use to be shepherded into the Personal Ordinariate of the Chair of St. Peter, home-based in Houston, Texas. Our Lady of the Atonement was founded by Fr. Phillips, a former Episcopal priest who could no longer stomach the liberal drift of The Episcopal Church. In the early 1980s he resigned his Episcopal priesthood and entered into the fullness of the Roman Catholic Church. Eventually he recovered his priesthood as a Catholic and went on to found Our Lady of the Atonement. On August 15, 1983, Our Lady of the Atonement Catholic Church was erected by papal authority, specifically as an Anglican Use parish and with the full encouragement and cooperation of Archbishop Patrick Flores (IV San Antonio). From those humble beginnings, Our Lady of the Atonement became a thriving Anglican Use Catholic parish with a dynamic K-12 parochial school. OLA is the mother church of the Pastoral Provision and Anglican Use in the United States which has eventually lead to the erection of the Anglican ordinariate by the Vatican offering a gracious way to provide disenfranchised Anglicans and Episcopalians a path to enter into the fullness of the Catholic Church yet retain beloved elements of their unique Anglican patrimony and liturgy. As Our Lady of the Atonement grew and flourished, Fr. Phillips realized the need to have his growing parish and expanding school undergirded in prayer in a way that only contemplative nuns can do. So he reached out to Mother Angelica, the Alabama foundress of Our Lady of the Angels Monastery and the Eternal Word Television Network (EWTN) for cloistered nuns. Ten years ago (2008) when the Clarian call was sounded, five professed nuns, Sr. Marie St. Clare, Sr. Rose Marie, Sr. Grace Marie, Sr. Mary Peter and Sr. Elizabeth Marie, responded with the blessing of Mother Angelica. 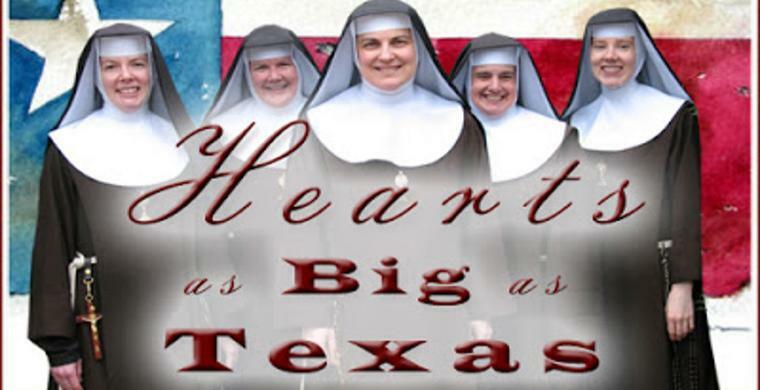 The Alabama nuns ventured to the Texas Hill County to establish a Poor Clare monastery becoming Mother Angelica’s second foundation of Poor Clares in the Southwest. Our Lady of Solitude Monastery was founded in 2005 in Arizona. Both the Arizona “Desert Nuns” and San Antonio’s “Texas Nuns” are daughter foundations of Our Lady of the Angels Monastery in Alabama. At the time, Mother Angelica’s community was bursting at the seams and the Hanceville, Alabama monastery was quickly becoming too small to accommodate new vocations. Fr. Phillips welcomed the Sisters with open arms and provided them a place to live, work and pray until they could build their own monastery — the Monastery of St. Michael the Archangel — which plans are still on the drawing board. For nearly a decade the brown-habited and black-veiled Sisters were a familiar sight at Our Lady of the Atonement. Many times they attended the various OLA Sunday and daily Masses and could be seen motionlessly kneeling in the empty church before the Tabernacle, silently offering up their prayers on behalf of the parish, the clergy, the parishioners and the students. The Poor Clares, which are a part of the Franciscan religious family, were a powerhouse of dedicated, consecrated, concentrated prayer which radiated forth from OLA touching all parts of the Archdiocese of San Antonio, the State of Texas, the United States and even the uttermost most parts of the earth. Much of what Fr. Phillip achieved was due to the prayers offered up on his behalf by the “Texas Nuns” and the graces they brought down through their hidden life of prayer and sacrifice. The nuns not only busied themselves with adoration and prayer, they also supported themselves by making sterling silver scapulars and selling Nonnavita organic soap. They also evangelized through their blog Quidnunc and through their live radio show The Good Habit, broadcast on the Guadalupe Radio Network. Having come from Mother Angelica’s Alabama monastery, they understood the way radio worked and how to use it to evangelize effectively. Mother Angelica founded WEWN shortwave radio network and the EWTN satellite television network. Fr. Phillips and Our Lady of the Atonement had a warm pastoral relationship with Archbishop Flores (1979-2004) and his successor Archbishop Gómez (2004-2010). Then in 2010, came Archbishop Gustavo García-Siller and the warm relationship with OLA and Fr. Phillips cooled and eventually became combative and hostile. Archbishop García-Siller is a member of the Missionaries of the Holy Spirit, a religious order based in Mexico City. First, he travelled to California to minister to the migrant workers, but was transferred to San Antonio after being an auxiliary bishop in the Archdiocese of Chicago. Born in Mexico, Archbishop García-Siller’s passion is ministering to Hispanics. Initially he envisioned Our Lady of the Atonement adding Spanish Masses to its crowded liturgical schedule. But he quickly found out he could not do that because OLA was erected by papal decree, issued by Pope John Paul II, as solely an Anglican Use parish where Elizabethan English has pride of place, not Spanish, even Castilian Spanish. Last year Archbishop García-Siller’s first shoe dropped. On January 19, 2017, just 10 days after the death of Archbishop Flores, he swooped in and unceremoniously forcibly removed Fr. Phillips as OLA’s rector and banished him from the property, sending him into exile to “reflect.” Fr. Phillips was immediately “replaced” by a Polish priest, Fr. Martin Leopold, the moderator of the curia for the Archdiocese of San Antonio, who “assured” the shell-shocked congregation that Fr. Phillips was still their pastor. As with most Latin Rite Roman Catholic bishops, Archbishop García-Siller did not understand nor appreciate the Anglican Use patrimony. All he saw was a thriving Catholic congregation with an attached school that he could change to accommodate his own vision of ministry to the growing Hispanic population in his archdiocese. He then became alarmed when Fr. Phillips proposed to bring OLA into the Ordinariate after Bishop Steven Lopes (II Ordinariate) was enthroned. The Anglican ordinariates were erected as a result of the Anglicanorum Coetibus issued by Pope Benedict XVI in 2009. Since then, three ordinariates have been established: Our Lady of Walsingham in England and Wales; the Chair of St. Peter in the United States and Canada; and Our Lady of the Southern Cross in Australia. Former Episcopal Bishop Jeffrey Steenson (VIII Rio Grande) was tapped as the first ordinary. However, since he is a married man, he was made a mitered monsignor and not a bishop. The first bishop-ordinary of the American ordinariate is Bishop Lopes, who was enthroned in November 2016. During Monsignor Steenson’s tenure as Ordinary, the other established Anglican Use parishes in Texas — Our Lady of Walsingham (Houston) and St. Mary the Virgin (Arlington) — came into the Ordinariate. But for the time being Our Lady of the Atonement (San Antonio) was content to humbly remain a Pastoral Provision parish as the North American ordinariate was erected and got its initial footing. But once Our Lady of the Atonement made a move to join the Ordinariate at that moment, the San Antonio archbishop took a page from the Episcopal playbook. Fr. Phillips and his parishioners could enter the Ordinariate individually, but they would have to leave behind their property which they sacrificed and labored, scrimped and saved for more than 30 years to build. Archbishop García-Siller wanted the multimillion dollar OLA plant, which included the ornate English-style church and the newly-built expanded school. The conflict between Our Lady of the Atonement and the San Antonio archdiocese found its way to Rome and the Congregation of the Doctrine of the Faith which oversees the world’s Anglican ordinariates. A solution was hammered out and Pope Francis decreed that Our Lady of the Atonement would enter the Personal Ordinariate of the Chair of St. Peter and that Fr. Phillips be incardinated as a priest of the Ordinariate. However, he would never return to OLA as the rector. Rather he would become the pastor emeritus during his forced retirement. During Fr. Phillips’ two-month exile (Jan. 19-Mar. 21, 2017), the Poor Clare nuns reached out to the beleaguered priest. They offered him their altar to celebrate daily Mass since the Archbishop of San Antonio forbade the priest from entering Our Lady of the Atonement. The good Sisters also offered Fr. Phillips their friendship, concern and, most importantly, their heart-felt prayers born out of deep sisterly love. For religious sisters or nuns to live, work and pray within a diocese or archdiocese, the local ordinary — bishop, archbishop or cardinal — must give his permission for the religious order to set up shop in his territory. Initially the Poor Clares received that permission from Archbishop Flores in 2008. And when Archbishop Gómez came on the scene, he was pleased to have Poor Clares in his archdiocese. But now Archbishop García-Siller has rescinded that permission and the nuns have been sent packing back to their motherhouse in Alabama. Obediently the three remaining nuns — Sr. Grace Marie, Sr. Elizabeth Marie and Sr. Mary Peter — packed and quietly left San Antonio, leaving behind them a void of prayer, questions with few answers as well as surprise, sadness and frustration. Parishioners feel that the Sisters’ forced removal from OLA is payback for the parish entering into the Ordinariate, intact with all its property — church and school — as well as creating a noticeable drop in archdiocesan income. Archbishop García-Siller may have run his Poor Clares out of town, but there are still Poor Clares praying in Texas at monasteries located in Brenham (Diocese of Austin); Amarillo (Diocese of Amarillo); and Alamo (Diocese of Brownsville). None are left in the Archdiocese of San Antonio. For-the-most-part, since the San Antonio Poor Clare nuns are cradle Catholics and are not Episcopal or Anglican converts and they come from a Roman Catholic religious order, they do not come under the immediate protection of either the Ordinariate nor the Pastoral Provision. Therefore, they are subject to the whims of the local Roman Catholic bishop. In this case Archbishop García-Siller of San Antonio. He has spoken and they humbly obeyed. This sort of thing would not happen to the All Saints Sisters of the Poor in Catonville, Maryland, which was founded in 1872. Fast forward to 2009 and the Episcopal order of religious sisters became Roman Catholic and were received into the Catholic Church by Archbishop Edwin O’Brien (XV Baltimore). Even though they have not entered into the Ordinariate, they are protected by guidelines of the Pastoral Provision from local episcopal overreach. In 2013, eleven members of the Community of St. Mary the Virgin, a Church of England Anglo-Catholic religious order, swam the Tiber and became Roman Catholic. The Sisters, including their Mother Superior, were welcomed into the Ordinariate of Our Lady of Walsingham and therefore are secure under the English Ordinariate’s protection. Canonically there are no Religious Sisters currently a part of the Personal Ordinariate of the Chair of St. Peter, although there are a few who are individual members of the Ordinariate. However, several Sisters of Mary, Mother of the Eucharist, an active Dominican order, have started a Texas foundation in Houston and Sr. Thomas Aquinas has signed on as Director of Education at Our Lady of Walsingham, which is now the cathedral church for the Houston-based ordinariate. The Dominican Sisters of Mary-Eucharist are safe at Our Lady of Walsingham. Daniel Cardinal DiNardo is welcoming and there are also two other Dominican orders living, working and praying in the Archdiocese of Galveston-Houston including the Dominican Sisters of Houston and the Vietnamese Dominican Sisters. VOL reached out to the Archdiocese of San Antonio and the Ordinariate of the Chair of St. Peter for comment and was met with silence by both.